We started out by going to COMERICA PARK MUSEUM (Detroit Tigers). We got into the park to get into the museum and found that there's a lot more to see in the ballpark. 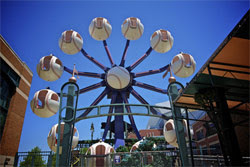 we got inside a booth from the "Fly Ball Ferris Wheel". Alejandra wanted to experience the Carousel and sit down in one of the 30 tigers that has it, that was pretty cool. plus i took pictures with the statues that aligned the left field wall, i was so thrilled to take a picture of Ty Cobb! still waiting for my "Sparky" Anderson statue!! Then, we headed to FORD FIELD (Detroit Lions). We both are major Football fans, so we went to the game of these newly revamp Lions vs the Bears. Oh boy oh boy! all i have to say is that watch out Green Bay, cause is not going to be easy this year to head to the Super Bowl...Alejandra and i am rooting for my Pats! I have to say that if you find a woman who likes football as much as you, marry her! and that's what i intend to do!! Wings) and there's no greatest team in hockey history then the Red Wings. Just the name recalls a long history of parades and cups! we got some tickets for the game vs the Canucks, so we were very excited to attend the game. plus, alejandra and i got some jerseys so we can feel part of the fans! i wanted to do something romantic for Ms Hotness, so the lobby concierge told me about this italian restaurant called BACCO RISTORANTE. At the restaurant entrance it has a pretty nice explanation that bacco is the Roman God of Wine. We were escorted to the outdoor patio and the night was superb, the moon was shining and the temperature was around mid 60s, which was excellent. We both love italian food, so Alejandra asked for the spaghetti allo scoglio (or spaghetti with custaceans), and i ordered Tagliolini alle vongole (the pasta is similar to the fettuccini, and vongole are clams). While we waited for the food, we got our crispy bread. it was crunchy in the outside but inside was soft and as you put the butter, it was melting, so good was that we were asking the waiter that at the end we wanted to bring to our room a little more of that bread! the food was so good and amazing that we both were laughing cause we caught each other licking our fingers! Detroit was a fascinating city! there was a lot that we couldn't see, but i guess we will leave that for the next time we travel here. we had fun and it was a terrific time of the year to be here. Hopefully the Tigers will win their games and head to the World Series!